and have a positive physiological impact, especially in the brain and nervous system(s). Immerse yourself in the ancient Buddhist and Hatha Yoga traditions that together have the capacity to cultivate and sustain true presence. This yoga and meditation retreat is designed to help you experience a sense of presence, equanimity and overall wellbeing. In addition, you will receive simple, take-home tools to maintain this sense of grounded ease throughout your everyday life. Multiple guided and open meditation practices throughout the day. 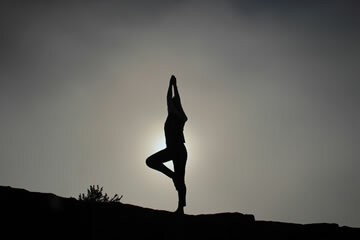 Specific Hatha Yoga practices to support clear meditation and balanced presence in life. Dynamic, engaging discussions on the Buddhist and Hatha Yoga teachings related to cultivating presence. Walks through the magnificent redwoods and along the ruggedly beautiful coast. Free time daily for your own exploration/integration process. A relaxed and spacious schedule. Luxurious accommodation in beautiful, simple cabins nestled in the coastal redwoods. All meditation and yoga sessions, guided by world-class, seasoned teachers who each have over 20 years of experience. If you would like to extend your stay on either end of the retreat, Ratna Ling will offer you an extra nightly rate. A limited number of private sessions will be available with either Meg or Lauri for yoga therapy and/or guidance on your personal practice. Various wellness treatments (i.e. massage, acupressure, aroma therapy, etc) are available through Ratna Ling. This program does not qualify for Ratna Ling promotions and/or discounts.